Facebook along with some of its most prominent family of apps were down on Wednesday leaving users around the globe unable to use their favorite services for a prolonged period of time. It was the longest outage in the history of Facebook, but at the time of writing the cause of the interruption has not been made public. Fans of Facebook were not the only ones impacted, however, as users of Instagram and WhatsApp (both owned by Facebook) also reported problems gaining access to services connected to them. Facebook were left to use Twitter, their biggest social media rival, to let their users know of the situation stating: “We’re aware that some people are currently having trouble accessing the Facebook family of apps. We’re working to resolve the issue as soon as possible”. The outages that began on Wednesday afternoon (US time) affected people across the world, including in Europe, throughout the Americas and in parts of Asia. 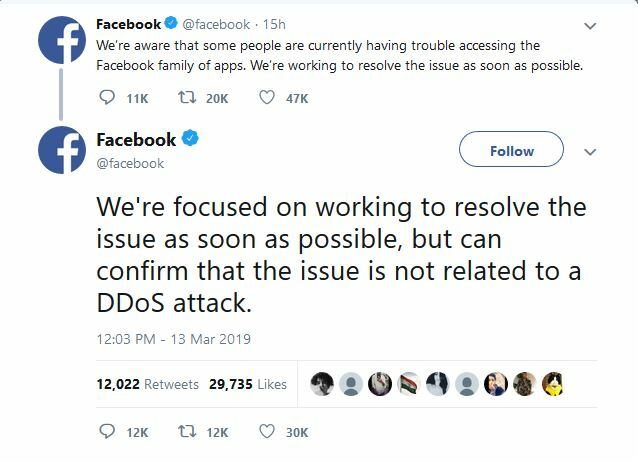 While the company moved quick to dismiss that the outage was as a result of a possible DDoS attack it is worth noting that there have been several large-scale incidents in the past year that have caused wide-scale disruption to websites. We have covered such attacks on the cryptocurrency exchange Bitfinex, the massive attack on GitHub, and the largest recorded DDoS attack that clocked in at 1.7 terabits per second (Tbps), beating the previous record of 1.35 Tbps.